Madison College’s Taylor Nelson (20) drives past a Rock Valley College defender during her team’s 87-79 loss on Jan. 14. As it entered its game against perennial powerhouse Rock Valley College, the Madison College women’s basketball team had reasons to be optimistic. The team had won seven straight games. It had scored 90 or more points in four of those wins. And it hadn’t lost since November. Despite losing, 87-79, to No. 4 ranked Rock Valley on Jan. 14, Madison College showed it can compete against the best the conference has to offer. 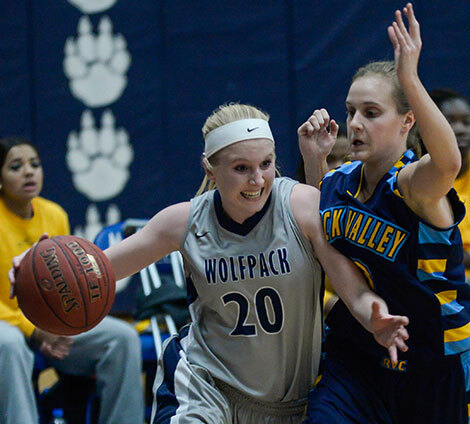 Rock Valley shot very well, hitting 61 percent of its shots, but wasn’t able to pull away from the WolfPack. Madison College was led by Megan Petty, who scored a season high 20 points. Taylor Nelson added 18 points and five rebounds, while Kelly Calhoun had 12 points and eight assists. Both Petty and Nelson said they felt good about how their team performed against a nationally-ranked team. Nelson liked her team’s aggressive attitude against Rock Valley. One area for improvement both Petty and Nelson mentioned was rebounding. Rock Valley out-rebounded Madison College 39 to 28. Madison College will face Rock Valley once more during the regular season and possibly again in post-season play. Nelson is confident her team’s chances if the two meet in the playoffs. Madison College now stands at 10-4 overall and 2-1 I the conference. It’s next home game will be Saturday, Jan. 24, at 1 p.m. as part of the annual Jam The Gym event. Jenna Endress scored 22 points and Taylor Nelson added 21 as Madison College posted a 94-55 win over UW-Marathon County on Jan. 12. It was a big night offensively as Madison College shot 52 percent from the field and converted 19 Marathon County turnovers into 29 points. Kelly Calhoun added 11 points and Addison Hemming scored 10 for the WolfPack. Madison College had a big night offensively in its 103-46 victory over the College of DuPage on Jan. 10. Five players scored in double figures for the WolPack. Taylor Nelson led the way with a triple-double, scoring 21 points, grabbing 10 rebounds and adding 11 assists. Also in double figures were Kelly Calhoun (18), Kaitlyn Kast (18), Sydney Harms (17) and Jenna Endres (12). Six players scored in double figures and Taylor Nelson posted a quadruple-double as Madison College beat Wilbur Wright College, 109-46, on Jan. 7. Nelson scored 21 points, had 11 rebounds, 10 assists and 10 steals for the first quadruple-double in team history. Kelly Calhoun led the team with 26 points, while Sydney Harms added 24. Also in double figures were Jenna Endres (11), Kaitlyn Kast (10) and Megan Petty (10).